Rods and cones generate nerve impulses in the retinas of the eyes that travel along the optic nerves to the optic chiasma, where they partially cross over. The sensory organs for vision - the eyes - are at the front of the head, but areas of the brain at the back and sides provide the actual visual sense. Mixed impulses from both eyes pass through the optic tracts to the striate cortex at the back of the brain and end in the temporal lobe area so that right and left halves of the visual field merge. 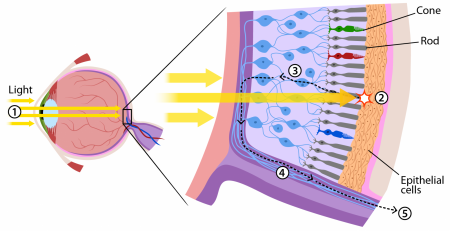 When light rays reach the retina (the film of the eye's camera), light energy is converted into electrical nerve signals. Crisscrossed with blood vessels, the retina has three layers of microscopically thin nerve cells. Nearest to the lens is a layer of ganglion cells, then a layer of bipolar cells and finally the photoreceptors. It is the photoreceptors that actually process the packets of light energy or photons that impact on the retina, so light must pass through the ganglions and bipolar cells to get to others. There are two types of photoreceptor cells, which, because of their shapes, are called rods and cones. Rods are sensitive enough to respond to a single photon, the basic unit of light, but together they create only one coarse, gray image, which is just adequate for seeing in poor light. Fine detail and color come from the cones, but they need a lot more light and work best in broad daylight. Inside the human eye, there are eighteen times more rods than cones. These are arranged in such a way as to produce the best possible combination of night and day vision.